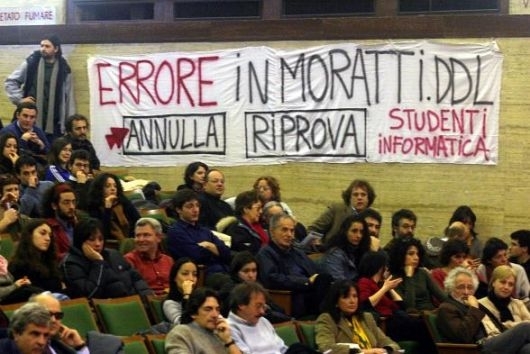 What's happening in the Italian University and Research World? La documentazione fotografica delle manifestazioni è liberamente disponibile. Avvisatemi se avete bisogno degli originali ad alta risoluzione. Clearly, I have my opinions about the reasons that bring the industrially developed countries to get more or less deeply involved in an endless series of wars happening (not quite always) in third-world countries. If you can't figure out what I'm talking about, here you can find a short and interesting excerpt from a book of Noam Chomsky. This image is about the war in Iraq. Please don't spam-mail me about it: plainly and simply, I think that war is the wrong answer. Public demonstration on 20th Mar. 2003 against the soon-to-come war in Iraq.